Home-Based Services for Infants and Toddlers | Akron Summit Community Action, Inc.
Home visits are made weekly with a Home-based Caregiver Teacher. Parents participate in planned child activities during the home visit and are given basic information in the areas of cognitive, language, motor, and social-emotional development. Parents receive information on child development and are supported in family goal setting. Parents are provided the opportunity to participate in play groups (family socialization) with their children twice a month and ongoing parent education programs that are schedule at least monthly. To provide ideas on the best use of toys and materials in your home. Families are expected to maintain scheduled home visits and participate in family socialization. Parents are expected to notify the home visitor, in advance, if they will be unable to maintain scheduled visits or participate in socialization. If a family is unable to attend their scheduled visit the home visitor will work with the family to attempt to schedule a “make-up” visit that same week. Continued poor participation may result in family being placed on wait list. Videotaping may be used on some home visits to help you develop your observation skills. Family Socialization is an integral part of the home-based program. Participation in bi-weekly family socialization is required for infant, toddlers and their families. Family socializations provide opportunities for children and parents to enjoy activities in a setting other than their home. 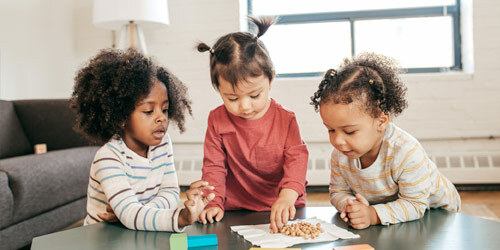 Children have the opportunity to play in small groups with other children their age. Families can meet and build friendships with other families enrolled in Early Head Start.